Most of us have heard of Flipper the dolphin and enjoyed his adventures but only a few have had the opportunity to see a dolphin, besides of in a zoo or aquarium. I had my first dolphin experience around the age of 12 when my family and I went to an open air dolphin show at the local zoo. For the show a few cute kids were called to the front and allowed to feed and stroke the dolphins. I felt excluded and sad that I was not picked as I so much wanted to get close to them. In that moment one dolphin emerged from the water at exactly my height and looked directly into my eyes. This happened each time he passed me and my heart was on fire. From that moment I “knew” that dolphins are something “more” than animals. To be close I chose to see them as often as I could. It was a special experience. Every time I caught their attention I felt uplifted. When dolphins jumped I watched children’s tears dry and serious people lightening up. They brought joy to everyone. In 1987 I sat meditating at a Goan beach with my eyes closed when a feeling suddenly touched me that I had never felt before. It was intensive, friendly and unfamiliar. It forced me to open my eyes. In that moment a dolphin jumped up high and my heart jumped with it. I closed the eyes again until that strange and forceful feeling came back. I opened the eyes and again a dolphin jumped. This happened a few times and I became aware that it was no coincidence. The new feeling and the dolphin’s jump were connected. It felt like an initiation. During this summer the contact became so close that dolphins often came near from far and swam around or next to me. The experience was not only “nice” but also frightening as some of the dolphins were large and moved the water wildly around me. The evening I returned to the Ashram I was invited by the mystery school to a closed dolphin group meeting. I shared my “initiation” experience and came to hear about similar stories from the other participants. From this year on I have had a close connection to dolphins, watching, swimming and “communicating” with them. Afterwards I always felt myself replenished. I followed up experiences of other dolphin lovers on the internet and in articles. 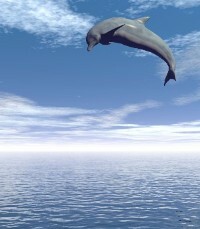 In recent decades “the secret” that dolphins have healing powers has become known and is accepted by therapists. 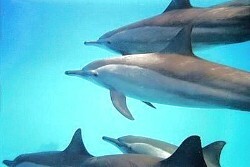 One can watch physically and mentally ill people quite rapidly improving while they are swimming with dolphins. 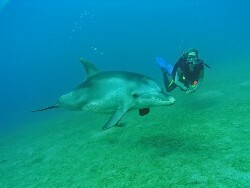 In April 2007 I was invited to participate on a10 day dolphin trip on Egypt’s red sea. It verified all my previous insights and experiences with dolphins and brought new surprises. We were a group of 14 people with only a few meditators and the crew. In the early morning I went to meditate on deck, which almost touched the water. As my silence sunk deeper I heard the dolphins emerging around me. The water started moving and they were chattering and jumping around for some time and suddenly disappeared until after lunch when most of us went for a swim. In small groups we left on a little dingy to search for dolphins. When we found them we waited until they surrounded us and then were “invited” one by one by their nudging to jump in and play with them. It brought plentiful joy to watch everybody’s contact with the dolphins and afterwards listening to their underwater stories. But it was something else to be oneself exposed completely alone to the vast sea, surrounded by a pod of 90 dolphins. That felt indescribably blissful, timeless and in deep oneness with the universe. There was no room left for fear, lost-ness and loneliness, only a vastness of peaceful unity. Through a mask I watched and followed the large pod of dolphins and was at times completely surrounded by them. They danced around me, whistling their dolphin call, playing hide and seek games, chasing each other, diving under me to pop up right next to me. In short they made me feel a part of their family. At one point I could only hear the dolphins and not see them because they disappeared into deeper waters. Suddenly a huge dolphin submerged from the depth, swam closely around me, stopped in front of me and looked deeply into my eyes. I have no description for that look, but I knew it was that of a Master. 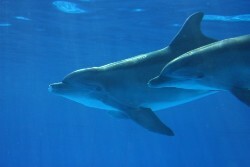 He swam to another smaller dolphin and it looked as if they conferred about me as they kept looking back at me. The bigger one returned, “checked me out” once again, returned to the smaller one to “confer” about me again and so on, a few more times. It was eerie and felt like I was being thoroughly analyzed. Finally they both disappeared into the depth to return with the whole pod. They came nearer, forming a dense ball of moving bodies under me when the following happened. An intense circle of light slowly moved up from the pod and met my body with an electric energy shock which was fully absorbed. I was in a state of timelessness and “such-ness”, similar to a Satori experience I had some years before. Warmth played around my heart and I experienced the same feeling I had in my first dolphin encounter in Goa in 1987 while meditating. A “message” and another “initiation” were given to me. Over the following days some extraordinary healing sessions happened through me. I then KNEW I had to merge dolphin-power with “my” healings and meditations. “My” healing-dolphin boat trip was born. There are only a few places where one can swim freely with wild dolphins and the Red Sea is one of them. 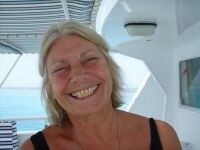 In April 2017 I will offer “my” next Dolphin-Healing Adventure and everyone who commits to the Self is welcome. There will be different dates available. Up to 18 people per trip will share 7 days of silence, laughter and exchanges on a boat in the Red Sea. Together we will meditate, swim and snorkel with dolphins in their own living environment, have healing circles and I will also give “whole-istic” healing sessions to those who want and need it. Every day will be spent at sea, with fresh air blowing in your face, swimming, reading, snorkeling, dancing, relaxing and connecting to yourself and nature. There are two people sharing an en suite cabin and delicious homemade vegetarian food will be cooked on board every day by 2 private chefs. Alcohol and cigarettes are not welcome and I promise you that you will not miss them at all. You will have to arrange your own flight to Hurghada (Egypt) where we will meet as a group. From there we will select our snorkeling and diving equipment for the people without their own and will drive through the scenery of the Egyptian dessert for 5 hours to get to our yacht to check-in. And the Dolphin-Adventure can begin! The following dates are planned for the 7 days Dolphin-Healing Adventure. Included in the trip: All transfers, 7 nights all-inclusive in double-cabin on boat with meals, snacks and drinks, daily-guided mediation and small healing circles. Excluded: individual session, larger healing circle, Flight to/from Hurghada, Visa, Cancellation fee. There is only limited space so book in time! Please contact me if you are interested in participating and want more information on dates and prices.